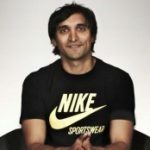 Ajaz Ahmed, patron de AKQA et co-auteur du livre Velocity, avec son client Stefan Olander, de Nike. Une interview par mail et en Anglais sur ce livre, aussi joli dans la forme que profond, qui apporte un nouveau regard sur la communication, qui n’est plus de la publicité, mais des idées en action. In Velocity, you say that advertising can be a product or service. Can you explain please? We think that agencies should be factories for ideas rather than factories for 'advertising'. As demonstrated with innovations like Nike Training Club, Fiat eco:Drive, Heineken StarPlayer, Delta Airlines app, an idea can be a service, an experience. The book is written as a conversation – is this because you believe in conversational marketing? We chose the conversational format because we wanted to make the book accessible and easy. Our aim is to create something of use to creative thinkers, leaders, managers, entrepreneurs and individuals who want to successfully navigate the new business landscape and go on an adventure, create their journey. For both large and small organisations, the book provides the philosophy we believe will help create a culture of excellence and an environment for enduring success through core values, through innovation and creativity. The main goal is we want to inspire entrepreneurial thinking, an entrepreneurial spirit in all organisations around the world that will hopefully lead to meaningful careers for people by moving their industry forward, creating great ideas that contribute to society. I was 21 when I founded AKQA, so maybe the book inspires people to start their own business. Stefan works at Nike and shares his experiences of the culture and hopefully that will inspire people within other organisations to be more innovative. Brands today need to be honest and humble. Do you think your book is sufficiently humble? (The case studies seem to be mainly AKQA work). A lot of people who get the book are interested in AKQA's and Nike's perspective. However, we have shared many anecdotes from different people, authors, industries and organisations. For example, we talk about J. Crew, Dyson, Charles and Ray Eames, Domino's Pizza. None of these are AKQA clients. What was it like writing the book with Stefan – as a client, is he always right? Stefan and I are lucky the work we get to do is at the cutting-edge of digital innovation. Also, we work globally, so meet a great number of people from all over the planet. Over the years we've been asked many times to share our insights and thoughts in a book. And even though we have worked together for 12 years on various Nike initiatives, we also thought we could learn a lot from each other in the process of writing the book - which turned out to be true - and for me it's the aspect of the project I enjoyed the most and now miss the most because the book is written. (But fortunately there is plenty to keep us busy, for example, we just opened an office in Paris). The toughest part about writing the book is that Stefan and I already have full-time, demanding careers and as time goes on we actually find ourselves busier than we've ever been. But once we figured out a process to do the book, along with our existing responsibilities, everything pretty much fell into place. We looked around and there are lots of books on the mechanics, the "how-to" of business or creativity or innovation, so we didn’t want to do another one of those. There are hardly any books about management philosophy though. So Velocity is hopefully a useful companion to all the other great business books that exist. The title of the book is Velocity so this meant it had to be fast to get through. We wanted it to be the kind of book you can read on a plane or train journey or sit down with for a few hours in an afternoon. What reaction have you had to the book so far? The book is also doing good in other ways, for example, it has raised a lot of money for charity - All my proceeds go directly from the publisher to charities that support youth homelessness and global healthcare). Some other feedback we have had, people tell us that they read it once to get familiar with the concepts, then read it again with a pen in hand to take notes or highlight particular points so they can put the thinking into action. I suppose that’s the result we want.